Is rustic majestic a style? This shade structure says it is! Stucco is rarely a surface one could call sleek, but it does lend itself well to contemporary rustic. Here the massive stucco pillars on this shade structure are fashioned with simple pedestal and cap manage to be a surprising blend of rustic modern majestic casual. It’s sophisticated but charming, and will look at one with the house. The stucco must dry thoroughly before it can be painted, though that white certainly makes it a focal point. Once painted, it won’t stand out so starkly in contrast. 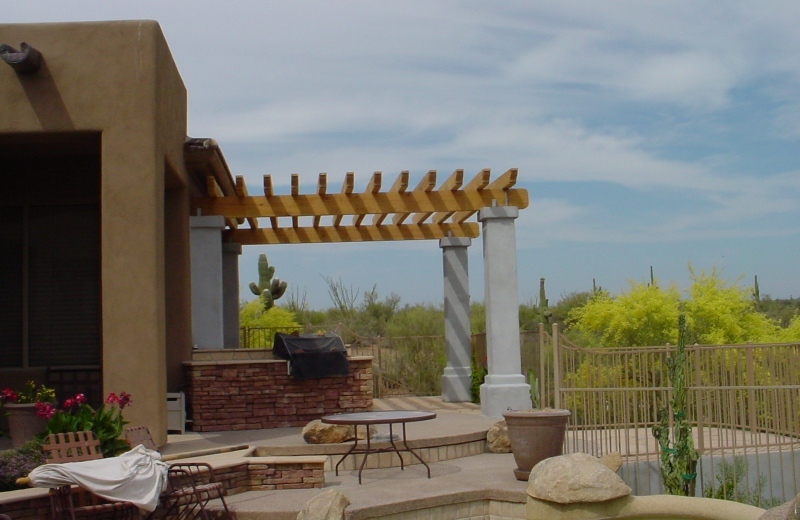 The ramada is the height of style for Scottsdale – Phoenix patio covers, and is always the perfect compliment to Southwestern architecture. In this client’s backyard the shade roof makes a seating area near the door and a few steps from the grill more comfortable for lounging and entertaining. There is another level to the right of this one forming a different ‘room’ on the patio. The image below gives you a bit better look at the spaces around the new shade roof.